One of the major reasons for composite failure is a breakdown of the bond between the reinforcement fibres and the matrix. When this happens, the composite loses strength and fails. By engineering the interface between the natural fibres and the matrix, the properties of the composite can be manipulated to give maximum performance. Interface engineering of natural fibre composites for maximum performance looks at natural (sustainable) fibre composites and the growing trend towards their use as reinforcements in composites. 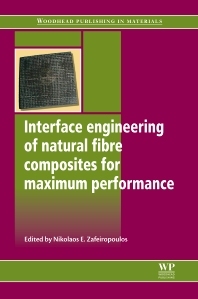 With its distinguished editor and international team of contributors Interface engineering of natural fibre composites for maximum performance is an invaluable resource to composite manufacturers and developers, materials scientists and engineers and anyone involved in designing and formulating composites or in industries that use natural fibre composites. Dr. Nikolaos E. Zafeiropoulos is Assistant Professor in the Department of Materials Science and Engineering at the University of Ioannina in Greece. He is widely regarded for his research expertise on interfaces in composite materials, the development of novel nanohybrid materials and composite hybrid colloids, and the application of x-ray scattering on polymers.